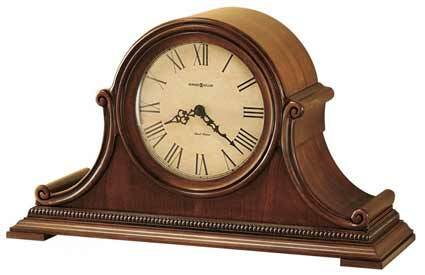 The Howard Miller Hampton 630-150 Chiming Mantel Clock offers a highlighted finish with book-matched cherry molding that frames the dial and offers scrolls on the sides. The aged parchment dial offers easy to read black Roman numerals and fancy black serpentine hands. A beaded molding accents the front and sides. Finished in Urban Casual Cherry on select hardwoods and veneers. Made in USA. Size: Height 11-1/4", Width 19", Depth 6-3/4". 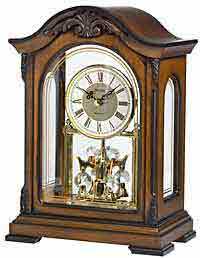 Clocks for sale at The Clock Depot including the 630-150 at discount prices.